The Italian and Austrian governments support curbing immigration in their countries and hope to restrict border crossings from Italy. During a conference on migration between the EU and several African countries held in Vienna on Friday, the interior ministers of Austria and Italy backed a proposal that would hold rescued refugees aboard ships in the Mediterranean Sea, rather than on land, until their asylum applications are processed, Deutsche Welle reported. "For those who manage to make it into a European state's territorial waters and are then picked up by a ship, we should use the ships to carry out the appropriate checks on whether they deserve protection," Austrian Interior Minister Herbert Kickl said at a joint press conference with his Italian counterpart, Matteo Salvini. After migrant routes from Turkey to Greece were largely shut in 2016, asylum-seekers have been following the Mediterranean route to Italy. The new Italian government has made shutting down the route a policy priority. The conservative government of Austria, which took in more than 1 percent of its population in asylum-seekers in 2015, has pledged to prevent another such influx and has sought to restrict border crossings from Italy. The Austrian and Italian proposal made at the conference, which also included representatives from Algeria, Chad, Egypt, Morocco, Niger, Mali and Tunisia, is an alternative to the "regional disembarkation platforms," currently located in EU Mediterranean ports. Matteo Salvini, who is strongly opposed to refugee rescue ships landing in Italy, said he was "absolutely in favor" of the proposal to hold migrants at sea. Spanish Interior Minister Fernando Grande-Marlaska and EU Migration Commissioner Dimitris Avramopoulos said that the idea of landing platforms was not supported by any of the African participants. "It's very hard for a country to accept something like that. Every country has its dignity, and we should recognize that," he added. Matteo Salvini also spoke frankly about Italy’s view of African migrants and Europe's aging demographic trends. "I am in government, paid by my fellow citizens, in order to encourage our own young people to have children… and not to uproot the best of Africa's young people," Salvini said. "In Italy, we feel it's necessary to help our children make more children. And not to have new slaves to replace the children we're no longer having," he noted. Italy became the main gateway to Europe for hundreds of thousands of asylum seekers arriving by sea since the other main route from Turkey to Greece largely shut in 2016. 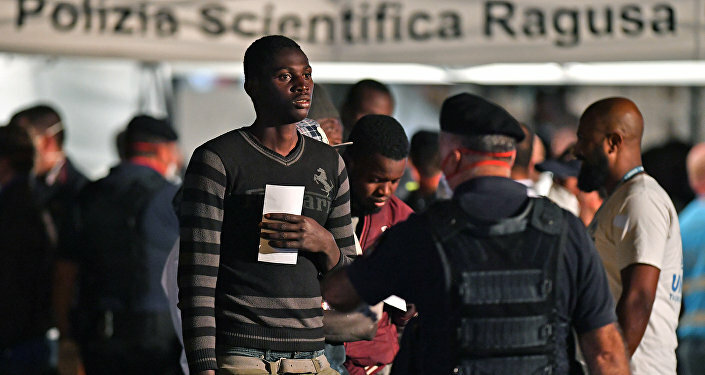 About 650,000 people, mostly from Africa and the Middle East, have landed in Italy since 2014.